I kinda kept this one quiet. Unlike other art projects, where I chronicle everything right down to the purchase of the supplies to build the item … this time, I’m just going to show you everything at once. I recently acquired a burlap sack online. With a little yarn and some time, I turned it into an amazing artwork. Here’s a step-by-step of what I did. 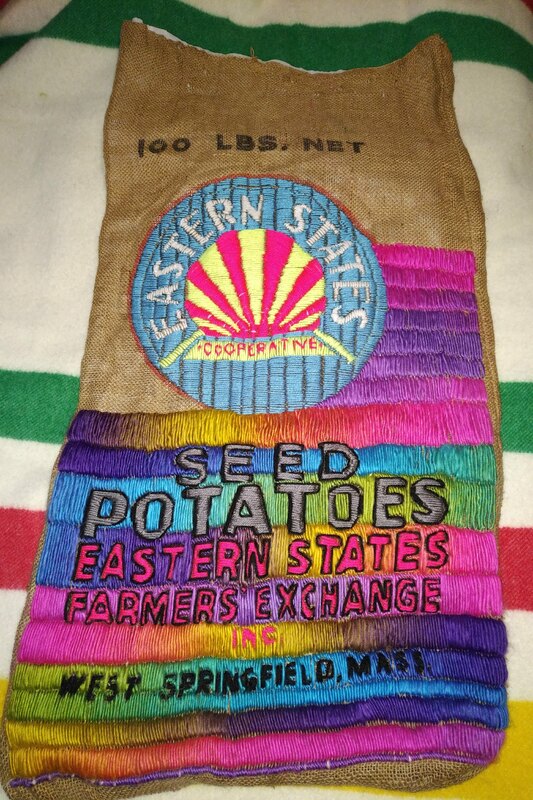 I picked up this Eastern States Farmers’ Exchange burlap sack for a few dollars on eBay. 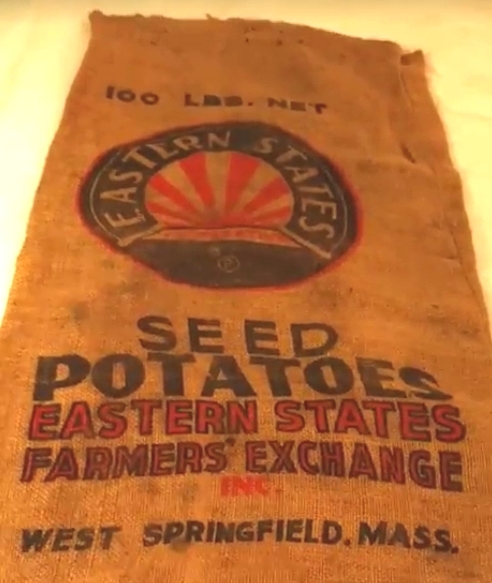 As its name signifies, the Eastern States Farmers’ Exchange sold farm goods and products throughout New England. Eventually this company merged with two other cooperatives (including the GLF Grange League Federation in New York) to form what we know today as Agway. I like the imagery and artwork on this burlap bag, and I wanted to really make this bag sparkle if at all possible. First thing. Since this is burlap, if I start threading yarn through it, I could pull and pinch the bag webbing, which would countermand my plans with this project. I added a yard of fusible stabilizing fabric to the bag’s insides, which should hold the weave tight to the stitch. I started with the lettering. I stitched the “Eastern States Farmers’ Exchange” in red with a black border. 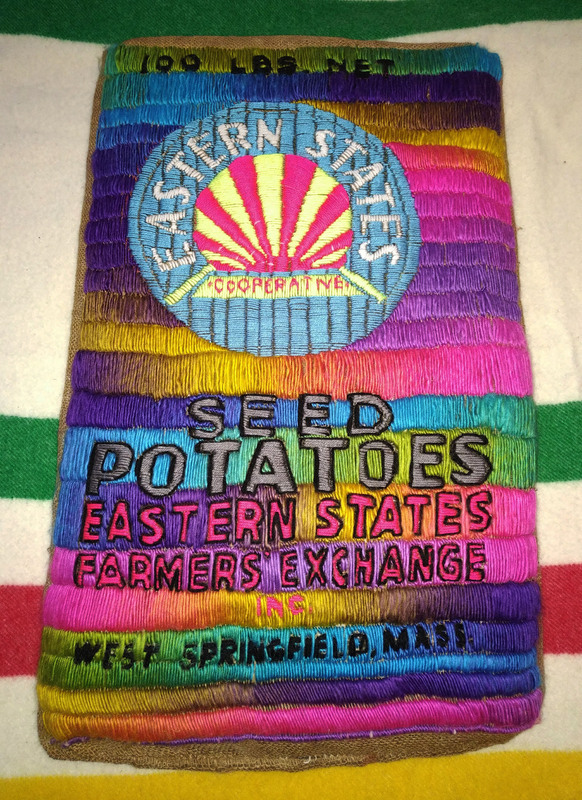 I then stitched the “SEED POTATOES” in grey with a black border. Simple enough. Then came the logo. Encompassing bright yellow fluorescent yarn, flaming red neon yarn, and standout light sky blue yarn, I threaded the strands through the circular Eastern States logo, stitch by stitch. It took about a week, off and on. But I completed it. Now comes the fun part. This bag needs a background. And I found it … in color-changing yarn. At Jo-Ann Fabrics, I found a very striking skein of color-changing yarn from a company called Lion Heart Brands. Their line of Wool-Ease yarn caught my attention – including a line called “Boardwalk,” with bright yellows and greens and purples. This will work. Is one skein enough? I looked at the shelves. They had only three skeins of this yarn left. Oh look, it’s on sale. Three skeins up to the cash register. Sales are good things, amirite? That color-changing progressive yarn I used? Here’s what one skein of yarn looks like when it’s threaded through the entire project. I started at the bottom of the sack, stitching from edge to edge. Once I reached an edge, I stitched in the opposite direction, just like a swimmer doing laps in the pool. That way, you can see that the yarn will match at the sides of each row. This took lots of patience and time – this yarn does not like to be “stitched” into burlap, and on occasion it started to fray and to unfurl. When I reached the logo, I stitched up the right side of the logo. I made it about two-thirds of the way … and then my skein of yarn ran out. Urgh. Luckily for me … I bought two other skeins at Jo-Ann Fabric that day. Ha. Gotta love those sales. Once I finished stitching up to the top of the bag (the “100 LBS. NET” section) and back down the left side of the bag, I needed to find a way to display it. Another trip to Jo-Ann Fabrics. I purchased a series of “cafe clips” for the top of the bag, as well as some foam squares. I applied the foam squares to a section of 20″ x 36″ art board, then slid the art board inside the burlap sack. It was a tight fit, let me tell you. Almost like trying to fit Dolly Parton into Paris Hilton’s wardrobe, amirite? And a photo for posterity. This is what happens when I start working on a project and don’t stop. Of course, now I can go back to my GLF Quality burlap sack and finish that one out. And you KNOW this is going in competition somewhere for Competition Season 2018. Of course… I have to figure out which competition this would fit into. But it’s nice to have good decisions like this, amirite? Rochester beats Albany 110-105 … and I return to the microphone! WOW!!!!! My chin hit the keyboard when I opened this page. I’m getting a serious case of skill envy. How did you manage to become so proficient in such a short period of time? And that yarn choice! Perfect! It’s not an easy yarn to work with, which makes it all the more impressive when viewing the finished project. Uh huh, I do detect a fellow yarn addict in the making. I’ll know it’s full blown when you scramble for the Sunday sale flyers before seeking out the sports section! I’ve said it before, I’ll say it again…Chuck, you AMAZE me!!! The tough burlap stitching..award worthy!! Chuck- Episode 013 is up. It’s a hot one.